The MS 24 Hour Mega Swim is back! - Aquamoves – Indoor and outdoor pools, fitness facilities and programs in Shepparton, Victoria. 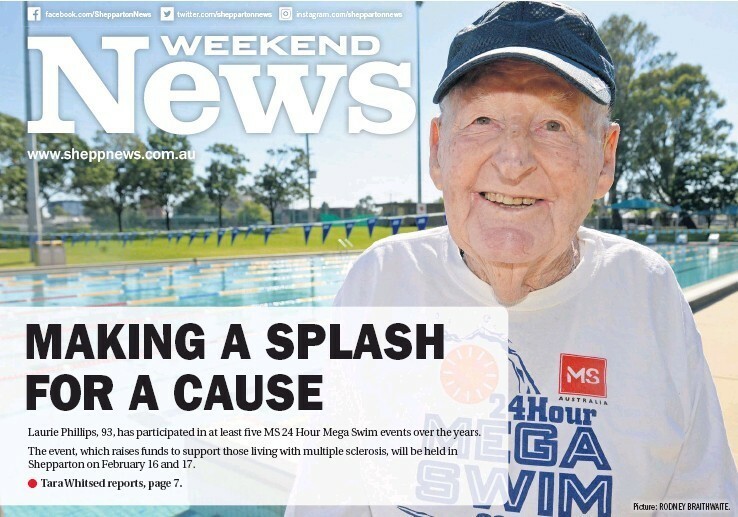 The Shepparton MS 24 Hour Mega Swim will celebrate its 10th anniversary this month, raising more than $150000 with almost 800 participants in that time. Event spokesperson Damien Stevens said this year it was hoped more than $20000 could be added to the total to support people living with multiple sclerosis. ‘‘The MS 24 Hour Mega Swim is a fun team relay event where teams have a swimmer in the water for the entire 24 hours and compete for laps swum and money raised,’’ he said. More than 15 MS 24 Hour Mega Swim events take place across Australia each year. Last year, nearly 3000 participants swam more than 400 hours across Australia, raising more than $850000 to support people living with multiple sclerosis. Events are organised by local committees with support from MS Australia. Now in its 18th year of the event, the MS 24 Hour Mega Swim was started by Carol Cooke, an Australian paralympian living with MS who had a vision of bringing people together to raise funds for multiple sclerosis. Multiple sclerosis is the most common neurological disease in young adults and diagnosis typically occurs between 20 and 40 years of age, although onset of symptoms may be earlier. The symptoms are varied and unpredictable. Mr Stevens said funds raised from the MS 24 Hour Mega Swim would go to MS victims by funding the Go for Gold Scholarship Program and financial assistance programs. Go for Gold Scholarships allow people living with multiple sclerosis to reach their potential in life, including employment, sport, travel, education and the arts. Financial assistance programs provide direct and immediate support for some of the 25600 Australians living with multiple sclerosis. To donate or sign up to this event and for more information, email megaswim@ms.org.au or phone 1300733690. The event will be held at Aquamoves in Shepparton on Saturday, February 16, and Sunday, February 17. Article courtesy of the Shepparton News, Saturday 2 February 2019. Written by Tara Whitsed. Picture by Rodney Braithwaite.